Produce Crate Solution Case Study – Our Team of Premium Storage Solution professionals can help your business find the right product for your business. Call us or visit our showroom at 327A Neilson Street, Penrose in Auckland. What was the problem the client needed solving? Our client runs a large butchery and meat processing plant in the Lower South Island catering for the hospitality industry as well as running a busy retail store. They were looking for a durable crate that would withstand heavy loads and being stacked in the freezer. A vented option was necessary to ensure that sufficient airflow was allowed. They also wanted to have their Company name stamped on these to ensure they come back from their clients premises after delivery. How did we help them solve the problem? We showed our client the range of produce crates that we had on offer. Colours are available with a minimum order quantity (MOQ) and we have the option of three sizes. Stocked are the 49 Litre as this is the most popular size, some 38 Litre and also available on Indent only are the 80 Litre. 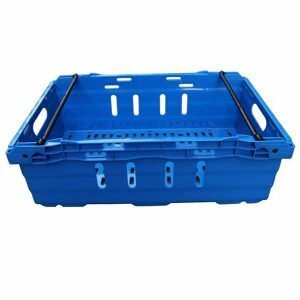 These crates are dimensional stable, ventilated and able to withstand freezer conditions. They are also impact resistant have reinforced nylon bars and stack and nest. What was the outcome for the best Produce Crate solution? Our client decided on the 38 Litre as the right choice for their business needs. As they wanted a non stock colour and their Company name stamped on them they ordered 500 in blue with a red logo.